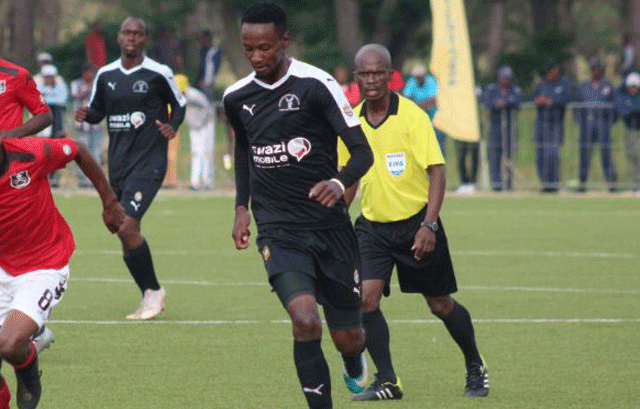 SOCCER – MBABANE Highlanders’ striker Thabiso Mokenkoane has reiterated his wish to play professional football in Europe following a decimating double hat-trick in the Eswatini Bank Cup. Mokenkoane’s goals saw his team emerge 9-0 winners over City Warriors at Mayaluka Stadium on Saturday. Interviewed yesterday, the striker said he has a burning desire to play in Europe, and hoped by God’s plans he would realise his dreams. “We can plan and dream big, but it is God who decides about our destination in life,” he said. Mokenkoane attended trials in Malta before the start of the season but was unsuccessful as he later re-joined Highlanders for this year’s campaign. He was recruited by then coach, Mlungisi ‘Professor’ Ngubane from South African side Pretoria University, also known as ‘Tuks’. His rout of City Warriors means he has now scored eight goals in his last three matches. Asked what he attributed his form to, the striker said working hard at training has resulted in a turn-around in his fortunes. “I missed a lot of matches through injury and I am grateful that the coach has put his faith in me to be part of the team’s attack again. It is true that I have done well since I have been re-introduced into the team, but I still feel I can do much better,” he said. The player also revealed that this was not the first time he scored six goals in one match. He said he once scored six times in a 15-1 win during the time he played in the ABC Motsepe League in his native South Africa in 2009. “It is always nice when you score goals as a striker, but the most important thing is to help the team win,” he said. Mokenkoane currently leads the pack in terms of top scorers in the Eswatini Bank Cup with his heroic tally of six. He retained hope that his team, Highlanders, would qualify for either the CAF Champions League or the Confederation Cup, come the end of the season. “Yes, I think we can qualify for CAF as long as we keep on working hard but smart and focussing more on winning our remaining games,” he said.